I could spend a great deal of time and energy looking up words in my thesaurus to describe my opinion of the new “alternate logo,” but I will simply say that I am appalled. STOCKTON, CA -The Stockton Ports unveiled their new alternate look at 2pm Friday, November 16th. The new identity is part of a six-month creative enhancement of the Ports franchise. “This is truly an exciting way for the Ports to re-affirm our commitment to Stockton. We feel this new logo embodies the rich history and can-do attitude of our city” said Team President Pat Filippone. The Ports new logos honor Stockton’s heritage as the largest in-land port in California and the Asparagus Capital of the World. A new character, 5 O’clock Dock, is the centerpiece of the identity, brandishing his baseball tattoos and asparagus club. Navy, Shipyard Gray and Asparagus green make up the club’s new alternate colors. 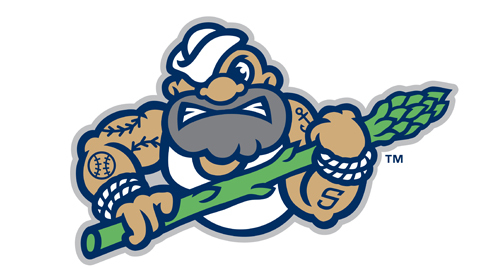 The Ports are the first professional sports team to use Asparagus green. The Alternate uniform feature navy tops with white trim and showcase the team’s riveted “Stockton” lettering across the chest. The new navy Alternate Cap features 5 O’clock Dock brandishing his asparagus club. The development process began last June when Jason and Casey of Brandoise met in Stockton with fans, staff and community members to learn about the stories, history, and personality of the Ports and Stockton. Brandiose developed the logos, uniforms and is dreaming up enhancements for the 2013 fan experience. Merchandise featuring the Ports new look is available now at Banner Island Ballpark at the Ports Team Store. Posted on November 30, 2012, in Baseball, Minor Legue, Ports and tagged 2013, Logo. Bookmark the permalink. 1 Comment.